Complete Plant Collagen Builder Natural Flavor, 10.58oz/300g (PlantFusion) - Penn Herb Co. Ltd.
Collagen is a specific type of protein produced within the body that is critical for healthy skin and joints. As we age, our ability to produce and repair collagen diminishes. Unfortunately, consuming animal collagen from supplements does not build collagen within our bodies - just like we can’t get smarter by eating brains! 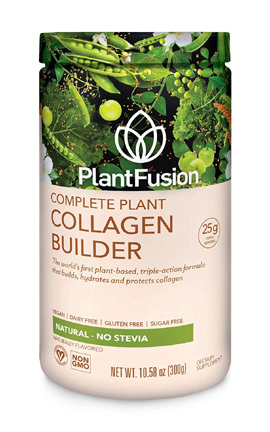 PlantFusion Complete Collagen Builder is completely different from other products in that it does not contain animal collagen. Instead it provides your body with the nutritional building blocks it needs to build, hydrate, and protect its own collagen - the way nature intended. And like all PlantFusion products, it’s 100% plant-based, allergy-free and non-GMO.